The cast members of drama “Protect the Boss” have gathered together again for a year-end party. Recently, Protect the Boss Song Jung Hyun posted the photos of all the actors and actresses attended the end-of-year gathering in a gallery. People in the pictures includes Choi Kang Hee, Kim Jaejoong, Ji Sung, Ha Jae Sook and director Song Jung Hyun, who were drinking together. 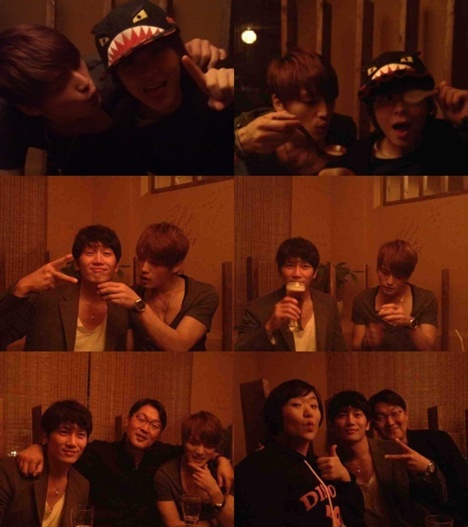 In the photos, Jae Joong was showing various humorous expressions such as pouting and sticking out his lips, wanting to kiss Choi Kang Hee, and making funny faces with a glass of wine in his hand, causing laughter who people who saw the photos. Netizens who have seen the photos said, “Thank you, director Song”, “It’s good to see that you all stay close even after the drama ended”, “Kim Jae Joong, lips, don’t do it” and so on. On the other hand, Jaejoong and Ji Sung was appearing on the KBS radio Cool FM “Choi Kang-hee’s Night Flight” hosted by the co-star in Protect the Boss Choi Kang Hee on December 25th.